Barnet kept their one-point lead at the top of the Conference with a win that all but ends Halifax's play-off hopes. The Bees went in front early on as Mauro Vilhete scored from close range and they almost netted again when Conor Clifford crashed against the bar. John Akinde did double the lead as he capitalised on a loose back pass to slot home his 31st goal of the season. The hosts ensured there was no second half Shaymen comeback as Curtis Weston headed home Andy Yiadom's cross. 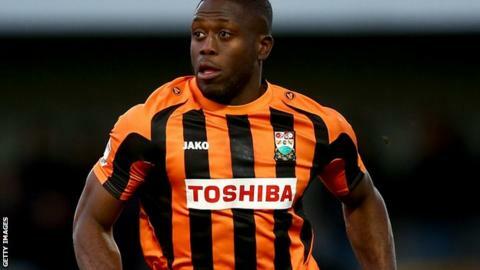 Barnet's success leaves them a point clear of Bristol Rovers in the race for automatic promotion, with two games left to play. Match ends, Barnet 3, FC Halifax Town 0. Second Half ends, Barnet 3, FC Halifax Town 0. Attempt saved. Luisma (Barnet) left footed shot from the right side of the box is saved. Assisted by Luisma. Michael Gash (Barnet) wins a free kick. Offside, FC Halifax Town. Jack Muldoon tries a through ball, but Jack Muldoon is caught offside. Attempt missed. Luke Gambin (Barnet) left footed shot from outside the box. Assisted by Luke Gambin. Substitution, Barnet. Luke Gambin replaces Curtis Weston. Substitution, Barnet. Luisma replaces Mauro Vilhete. Jack Muldoon (FC Halifax Town) is shown the yellow card for a bad foul. Substitution, Barnet. Charlie MacDonald replaces John Akinde. Attempt missed. Conor Clifford (Barnet) right footed shot from outside the box misses to the right. Offside, Barnet. Michael Gash tries a through ball, but Michael Gash is caught offside. Attempt missed. Mauro Vilhete (Barnet) left footed shot from the centre of the box is too high. Attempt blocked. Conor Clifford (Barnet) right footed shot from outside the box is blocked. Assisted by Sam Togwell. Goal! Barnet 3, FC Halifax Town 0. Curtis Weston (Barnet) right footed shot from the centre of the box to the bottom left corner. Assisted by Andy Yiadom.